Hypoglycemia is also known as low blood sugar. This condition occurs when the glucose in the blood suddenly drops below normal levels, according to Go Pets America. 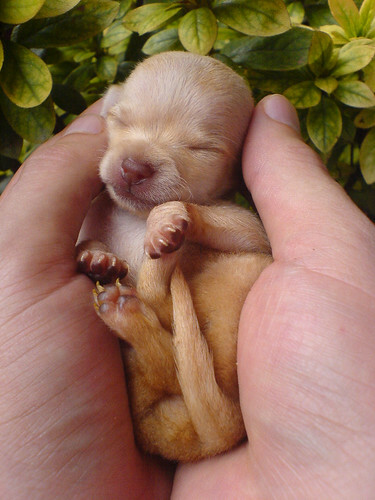 Many toy dog breeds have hypoglycemia, including toy poodles, Yorkshire terriers, and Chihuahuas. Recognizing the symptoms of hypoglycemia can make the difference between life and death. Margret Casal, DVM, PhD, of the University of Pennsylvania School of Veterinary Medicine explains that the brain uses only glucose for energy. Low glucose levels in the blood cause neurologic symptoms, such as trembling and disorientation. Some of the other symptoms of low blood sugar in Chihuahuas include a lack of coordination and muscle spasms. Hypoglycemic dogs are often cold and trembly and have difficulty standing and walking. They act weak, tired, and lethargic and may not want to eat even when food is offered. Dogs sometimes develop a bluish tinge or other discoloration around their gums or on their skin. These symptoms are the warning signs of hypoglycemic shock. If the dog's brain is deprived of glucose for long enough, the dog will become progressively weaker and more lethargic. Some dogs go into convulsions or seizures from low blood sugar. The animal may fall to the floor and jerk in uncontrollable muscle spasms. Dogs in seizures often lose control of their bladder or bowels. Hypoglycemic dogs can also lose consciousness or slip into a coma. The Epi Guardian Angels canine epilepsy website warns that death from sugar shock occurs quickly if the dog's blood sugar drops far enough and fast enough. Hypoglycemic attacks usually occur when the dog has not eaten for a long time. They can also happen if the dog becomes overly excited or stressed. The Chihuahua Club of America recommends feeding toy-breed dogs 3 or 4 times a day to keep their blood sugar at a stable level. If a Chihuahua begins to show mild hypoglycemic symptoms, the Epi Guardian Angels website suggests feeding it some regular dog food right away. Offer the dog a teaspoon of Haagen-Dazs vanilla ice cream or rub it on the inside of the dog's mouth and on its gums if its symptoms appear moderate or severe. Syrup, sugar water, corn syrup, and honey are acceptable substitutes if ice cream is not available. Feed the dog as soon as it shows signs of improvement. The Mar Vista Animal Medical Center warns that hypoglycemia is a potential emergency. If the dog loses consciousness or goes into convulsions, rub syrup on its gums and take it to a veterinarian immediately. The doctor will use an intravenous drip or injection to place dextrose directly into its bloodstream.